For Fellowships beginning in March 2019 or later. • on topics of intellectual and religious history. 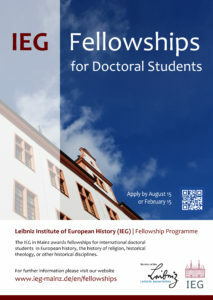 The IEG Fellowships provide a unique opportunity for doctoral students to pursue their individual PhD project while living and working for 6–12 months at the Institute in Mainz. The monthly stipend is € 1,350. Fellows are required to reside at the Institute in Mainz. They actively participate in the IEG’s research community, the weekly colloquia and scholarly activities. Fellows are expected to present their work at least once during their fellowship. The IEG preferably supports the writing up of dissertations; it will not provide funding for preliminary research, language courses or the revision of book manuscripts. PhD theses continue to be supervised under the auspices of the fellows’ home universities. We expect proficiency in English and a sufficient command of German to participate in discussions at the Institute. Please combine all of your application documents into a single PDF except for the application form and include a word count at the end of your project description. Please send your application to application@ieg-mainz.de. Letters of recommendation should be submitted directly by the referee. You may write in either English or German; we recommend that you use the language in which you are most proficient. 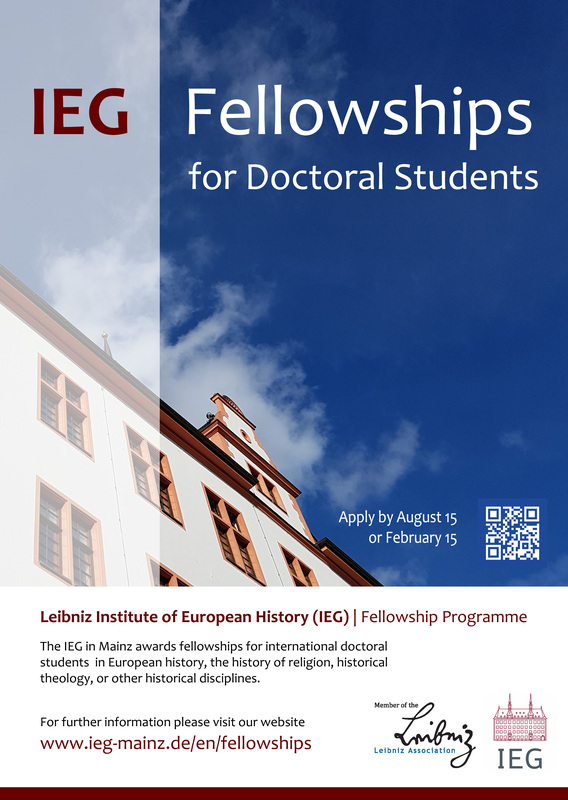 The IEG has two deadlines each year for the fellowships: February 15 and August 15. The next deadline for applications is August 15, 2018. This entry was posted in Actualités / News, Fellowships/Grants/Jobs and tagged IEG Fellowship by Fabian Klose. Bookmark the permalink.